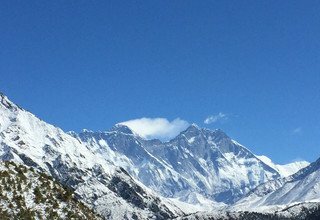 Everest Luxury Trek is a perfect deluxe trek if you do not have the time to trek in the Everest base camp but want to appreciate some of the most beautiful elements of the Khumbu, experiencing some of the unique culture, fauna and flora of the Himalayas. The life of mountain dwellers is vastly different from one we lead in the city and is worth having a look at. 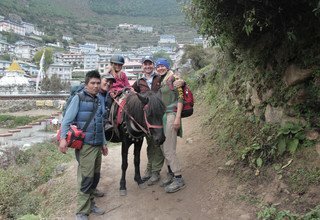 To look into the heart of the villages of these people we offer an exceptional 5 days trek featuring a wide range of spectacular scenery combined with unique cultural encounters with the Sherpa people who inhabit these high altitude regions. Namche Bazaar is a develop village of Khumbu region, this trekking start from lukla and reach there after spending a night in phakding, this trekking is short and suit trekking destinations for who have dream to see Mount Everest but not long length time frame, this trekking is call “EVEREST PANORAMA TREKS too”. 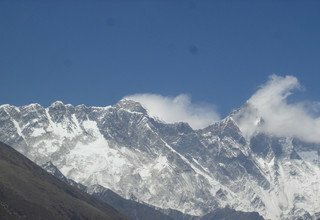 Namche is located at 3,440 meters even though far away Mount Everest, you able to see very nice view of Mt, Everest, Amadablam and many more white peaks, Almost everyone trekking in the Khumbu region will visit Namche Bazaar, as it is the gateway to the high Himalayas. Visitors are likely stay at least one night for altitude acclimatization. Upon our arrival at Tribhuvan International Airport in Kathmandu, we will be warmly greeted by a representative from Swiss Family Treks. After completion of your custom formalities (Visa, etc), we pick up your luggage and look for our representative with Swiss Family Treks display board at the arrival gate. We will be then escorted to Hotel. Welcome drink and we will give you a short briefing you’re your trek and relax at Hotel Yak and Yeti. Today after breakfast we start a guided tour to several of the most historical and spiritual attractions in Kathmandu Valley. Some of these landmarks are considered World Heritage Sites; including the historic Durbar Square, the sacred Hindu temple of Pashupati Nath, the famous 'Monkey Temple' (Swoyambhunath) and Buddhists shrine (BouddhaNath) which is one of the large Stupas in the world. At the noon, there will be a pre-trip discussion where we can meet our trek leader and other team members brief you regarding your trek as well as provide you opportunity to ask any questions you may have regarding your upcoming adventure. Stay overnight at Hotel Yak and Yeti. After breakfast, we will be escorted to the domestic terminal of Kathmandu airport for an early morning flight to Lukla 2,800m, a gateway destination from where our trek begins. After an adventurous 45 minute flight above the breathtaking green and white mountains, we reach the Tenzing-Hillary Airport at Lukla. This is one of the most beautiful air routes in the world culminating in a dramatic landing on a hillside surrounded by high mountains peaks. Upon arrival at Lukla, we meet our other crew members and after some packing and arrangements, we start our trek through the prosperous village of Lukla until we reach Phakding. To assist in acclimatization, we only have a short hike today. However, if interested in additional activities we can take a side trip to a nearby monastery. Stay overnight at Yeti Mountain Home in Phakding. Walking through a beautiful pine forest, the track leads us along the Dudh Koshi River through many suspension bridges, one of which is the famous Hillary Suspension Bridge. First, we catch wonderful prospect of the glistening Mt. Thamserku 6618 m. Through the settlement of Benkar, Chumoa, Monjo, we come to the check post and entrance to Sagarmatha National Park. We pass through the last village of Jorsalle before reaching Namche Bazaar. The trail climbs through the forests and bridges until we reach the confluence of the Dudh Koshi and Bhote Koshi rivers. After a final steep ascent of about two hours we get first sight of Mt. Everest peering over the Lhotse-Nuptse ridge. Upon this juncture, we stop at Chautara to admire the view. We still need to hike about 1.5 hours to reach Namche Bazaar, a gateway to Mt. Everest and main trading centre of this region. Stay overnight in Namche Bazaar at Yeti Mountain Home. This is the first of the two days set aside for "acclimatization". Health experts recommend us to stay active and moving during the rest day too instead of being idle. Today's journey starts with a climb up to the famous airstrip at Syangboche. Just above the airstrip is the Everest View Hotel, a Japanese scheme to build a deluxe hotel with great views of the highest mountains on Earth. We trek up for about 2 hours and then level off until we reach the Khumjung village. The Khumjung valley surrounded by the snowy peaks of Kondge and Thamserku and the sacred peak Khumbila, hosts a well known monastery that houses a yeti scalp. We also visit Hillary School which is at the same site. Another set of busy and colorful monasteries, lined with prayer flags and prayer wheels, are braced along the slopes high above this traditional village. We either spend the day taking a day's hike to Thame or visiting Khunde or relaxing and exploring Namche Bazaar itself. Namche Bazzar is the main centre of the Everest (Khumbu) region and has government offices, ATMs, Internet cafes, shops, restaurants, a bakery and a colorful market each Friday evening and Saturday. If we trek a few hundred vertical feet during the day, it will help us to properly acclimatize. Our guides take us to the Tourist Visitor Center near the headquarter of the Sagarmatha National Park where we can observe an assortment of things related to the first Everest ascenders, Sherpa culture and learn about the various plant and animal life of the Everest region. Stay overnight at Yeti Mountain Home. We have enough time in Namche to shop and relax in a bakery that serves coffee and cakes, and provides Internet access. A steep descent from Namche Hill leads to the suspension bridge crossing the Dudh Kosi River near the confluence of the Dhudh Koshi and the Bhote Koshi Rivers. We cross the Dudh Koshi River twice at separate locations before reaching Monjo. Upon this juncture, we are out of the Sagarmatha National Park after exiting from its official entrance near Monjo and finally reach Monjo Village. Monjo is comparatively a quieter place to stay than Namche and it also means we have a less strenuous walk back to Lukla next day. Stay overnight at Yeti Mountain Home in Monjo. Today, we start to get warmed up by the light breeze. Although we are traveling the same route down, we feel completely different views. We snap a mixture of open plains, rhododendron and pine forests, and in the distance snow covered peaks. We take time and walk leisurely today as this is the last day of our trek. We re-experience the Sherpa villages' impressive faith in Buddhism and culture of prayer stones and prayers flag while we walk through the villages. Upon arrival in Lukla, we have plenty of time to relax, stretch those sore legs, and recall the experiences of the last couple of days. We experience the culmination of a fantastic trek on a happy note with everyone back safe and sound with smile on faces! Upon arrival in Lukla, we stroll around while our leader will re-confirm our flight ticket. In the evening, we enjoy last dinner with our crew. Stay overnight at Yeti Mountain Home. Today, we fly back to Kathmandu after our long mountain journey. The early morning flight drops us in Kathmandu. We can rest and relax throughout the day at hotel. If we get interested to take some gifts home from Nepal for friends and relatives, we can visit to some nearby shops or venture out in Thamel for typical Nepalese goods. Stay overnight at Hotel Yak and Yeti. After breakfast, we are going to visit two historical monuments which represent early and late medieval history, architecture, culture and religion. Bhaktapur Durbar square is an ancient newari city, 13 kilometers far from Kathmandu stores numbers of Hindu temples, 55 windowed medieval durbar and offers you various examples of metal smith and wooden craft along with the opportunity of exploring traditional pottery work to the another corner. Patan durbar square is equally important which represents late medieval history, Culture and architecture. Stay overnight at Hotel Yak and Yeti in Kathmandu. Day 10: Final Departure to International Airport as per your flight schedule. The journey within the mountains of Nepal comes to an end today! There is nothing to do but you just trade emails to travel companions and organize your photos. If you have more time we can do some shopping or sightseeing. At last approximately 3 hours before our scheduled flight, a representative from Swiss Family Treks escorts us to the airport. 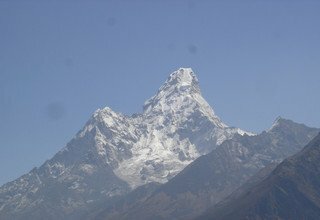 On your way to home we will have plenty of time to plan your next adventure trip in the wonderful country of Nepal. * 4 nights deluxe accommodation in twin bed sharing basis with breakfast at 5 Star Hotel Yak and Yeti in Kathmandu. * Guided sightseeing tour in Kathmandu Valley and all entrance fees. 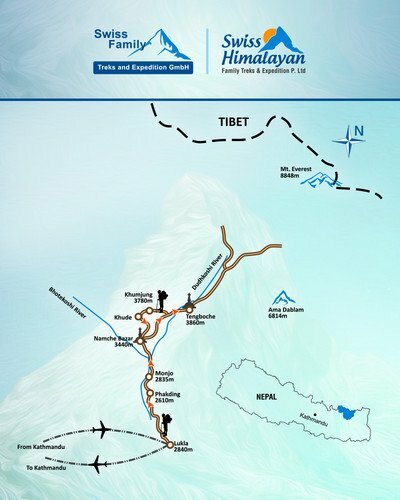 * 4 Nights Deluxe Yeti Mountain Home in twin sharing basis during the trek.